Cucumbers are always the last thing I plant in my garden. I sow the seed June 10th and that way I have cucumbers in the fall when the tomatoes are ready. 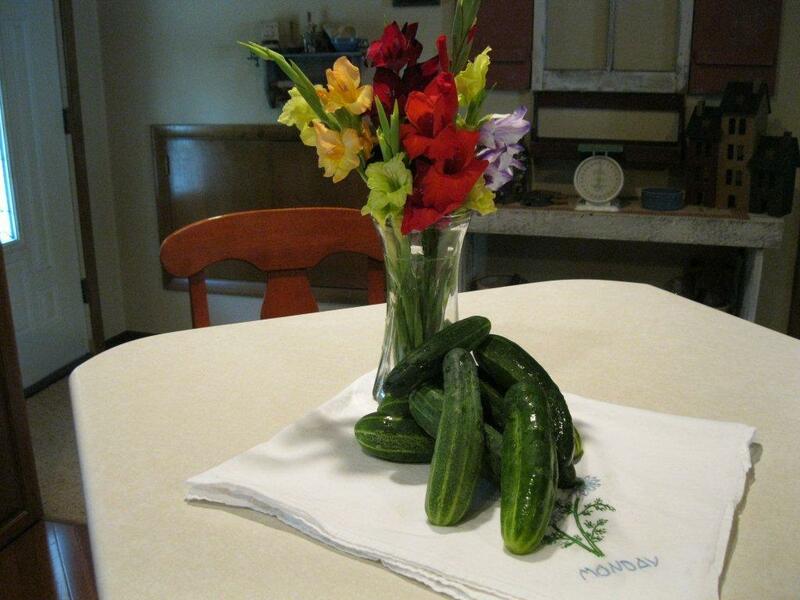 As the old saying goes, if you have one cucumber you have many, so it’s time for making pickles! This is a very simple recipe that only takes about two hours from start to finish ( minus the cucumber growing time of course!) These pickles are stored in the refrigerator. They will keep forever but no matter how many I make we always seem to eat them up quickly! I usually make about 40 pints and that way I always have extra to share with family and friends. 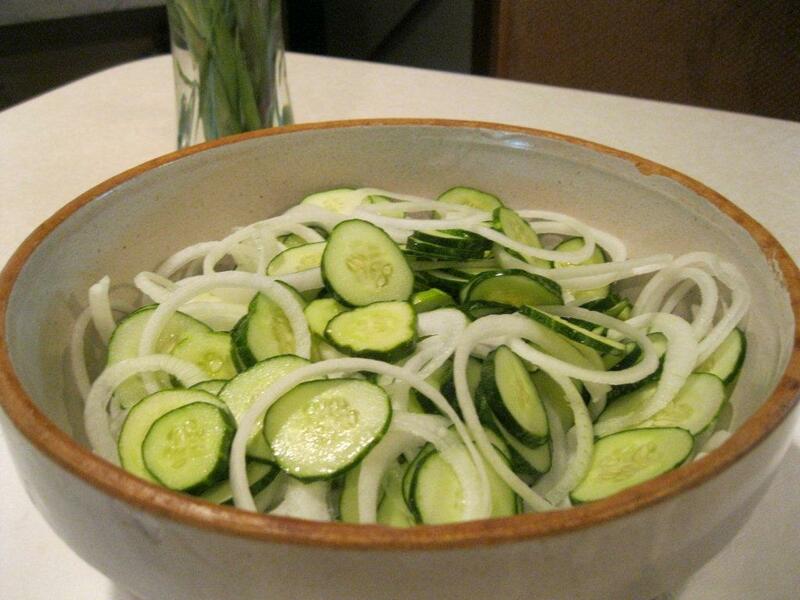 Slice cucumbers and onions thin and put in large bowl and sprinkle 2 tablespoons of salt over the top. Cover the whole bowl with ice water. Let stand 2 hours and remove any ice left and drain. Do not rinse. Place pickles and onions in jars. I use canning jars, but any jar with a good tight lid will work. Make the following syrup and bringing it to a boil until clear. Pour over pickles and let cool before putting the lid on. The pickles will rise in your jars some some, so be careful not to over flow your jars. Let sit at least 12-24 hours in the refrigerator before serving. Enjoy! 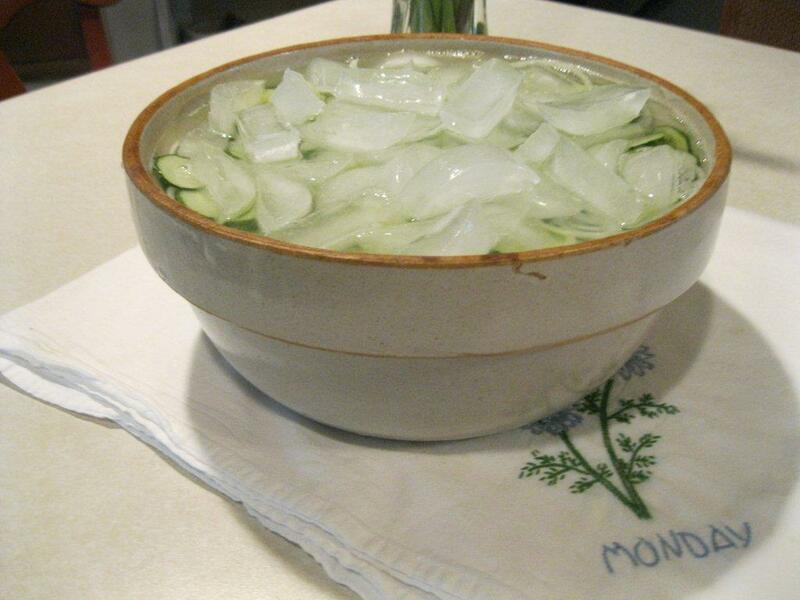 Slice cucumbers and onions thin and put in large bowl. Sprinkle 2 tablespoons of salt over the top. Cover the whole bowl with ice water. Let stand 2 hours and remove any ice left and drain. Do not rinse. Place pickles and onions in jars. Combine your sugar, vinegar and celery seed in a pan and bring to a boil. Pour the above mixture over pickles and let cool before putting the lid on. The pickles will rise in your jars some, so be careful not to over flow your jars. Let sit at least 12-24 hours in the refrigerator before serving. A Perfectly Grotesque Dinner - Just in time for Halloween! Snickers, you are such a domestic goddess! It sounds like a very easy recipe, even for those of us that are somewhat challenged when it comes to all things culinary and the end product looks yummy! I envy you having a garden lol. Your flowers are gorgeous! I agree! Chardonnay! Snickers is most certainly a domestic goddess. I have never made pickles before but I am inspired to try! Thanks snickers for the recipe. After I received snicker’s recipe via email, I made it because this is one of my favorites. They are so easy to make and are delicious. Thanks snickers, for making it simple and easy to follow and make. I truly wish I was a neighbor of yours. I am a pickle addict and I am definitly going to give these a try. Oh snickers, My mom used to make those. They are delicious. The girls are right, you are a domestic goddess ! I love seeing what you’re up to ! I want to live with Snickers. I think she is just as talented and far more approachable than Martha Stewart. Can I just add that the pictures in the post are beautiful? I am so impressed with our culinary team here! Snickers, did you grow those flowers too? I love this. We have a family recipe for dill pickles, but not for sweet pickles. We will be trying these soon. Thanks! Yes, those are glades out of my flower gardens. I usually have fresh flowers for our home until it freezes. Awesome recipe. Yes, I have a good recipe for dill refrigerator pickles, but now I have one for sweet ones as well! Yummy! Can I ask you how you do your freezer coleslaw? I tried spreading my cabbage out a bit but now I got 4 huge heads of red cabbage and I dont know what to do with them. If its got sugar in it though just say your on your own. LOL. I cant do sugar. What till you see the size of some of my peppers aaand I got hailed on no less. After years of ups and downs. Sugar or not can I have your recipe for freezer coleslaw? I know how to adapt. I posted it under the sweet corn post. Sorry!! You can find it there, Enjoy!! I know its really late, being November and all, but I am going to try this recipe for my daughter. She love pickels as well as her 3 daughters (my granddaughters). It will make a nice Thanksgiving gift for her. Thanks for sharing the recipe, I know she will love them! I’m so glad this link came across my twitter TL because I missed this recipe the first time around. These look delicious and I can’t wait until my cukes are ready so that I can try these. Any chance you have a recipe for refrigerator dill slices too Snickers? My husband buys them from our butcher shop of all places, and is nuts for them. He pays almost $4.00 for a very small container and I’d love to surprise him. I will post a simple recipe later tonight that I use. This makes a nice batch. 40 fresh dill sprigs, rinsed and trimmed of any bad ends. Do not over leave dill in water. 2 large sliced onions, sliced thin ( this is an option, you do not have add them if you don’t want to. In a large pan or Dutch oven, combine the sugar, water, salt, and vinegar and bring to a boil, cook and stir until salt and sugar has dissolved. 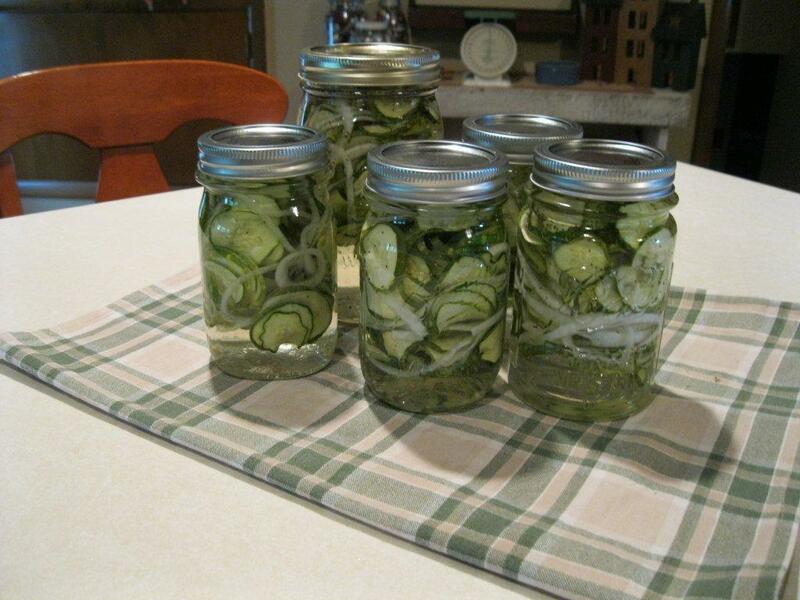 Place cukes in jars or a contain that seals tightly, I prefer glass jars with good lids. Pour the liquid over the cukes and let cool before sealing your jar. Cover tightly and refrigerate for at least 24 hours/ you can store them up to 2 months in your frig. Enjoy! I left out a step, put the dill, onion and garlic into the jars with the cukes. I just put some of each depending how big my jar is. You can also mix everything together and pack your jar. I find this too messy to do, so I pack my jars and poke the dill and some sliced garlic into my jars, and pour the liquid into the jar. Thanks Snickers, you’re a true peach. Pickling cukes aren’t abundant where I live for at least another week. I’ll have to take a pic when I tackle this to share. I really appreciate it! 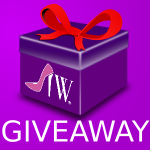 Looking forward to seeing your results, it’s fun to try something new. Thanks snickers I am going to try this soon. We love pickles here and I have so much dill! Made these pickles last night, kids started eating them this morning, entire batch is gone. They were delicious and super easy to make. I love pickles and have always wanted to try making my own, but have been very intimidated by the recipes I’ve found. These pickles look and sound delicious and I really think I can make these! Thank you for sharing! Made a triple batch of Snicker’s Pickles today. Made me think of all the great friendships I made at IW. Hope you all are having a great summer. These are the best so easy and the crunch is amazing. My husband loves them. Making 4 batches. They last really well. Thanks for this sweet recipe..